Argentine Malbec has won multiple awards and recognitions over the years, demonstrating the path of continuous improvement. In addition, competing has contributed to positioning it internationally as the most outstanding wine. 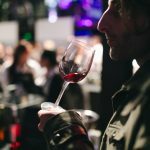 Out of a total of 110 medals awarded in the MMS, Argentina won 78, being the only country to obtain 3 “Master” awards, reserved only for the best wines. Also, from the £30 category, only Argentina was distinguished with medals. The rating of the English market is proof of the quality of the product, since the United Kingdom has managed to become the second biggest market for imports worldwide and today represents more than 10% of the exports of Argentine fractionated wines. According to a Kantar Panel market survey, Argentina is the country with the highest growth in that region in the last three years, increasing its exports by 23% between 2014 and 2015. Recently, much has been said about its unique pre-phylloxera condition. Argentine winemaker Roberto de la Mota, of Viñedos and Bodega Mendel, a member of the International Academy of Wine, points out that “Malbec was planted in Argentina and more especially in Mendoza on a pie franco, that is to say without grafting, according to the 1968 census Of the National Institute of Vitiviniculture, with 48,000 hectares only in this province. This vast area of pre-phylloxera Malbec (no new vines were imported until 1989 and in this case, they were other varieties) became the most important genetic reservoir, since there are mass selections of quality and unique phenotypes. “ These accuracies account for the pre-eminence of the strain at a national level despite the passage of time. 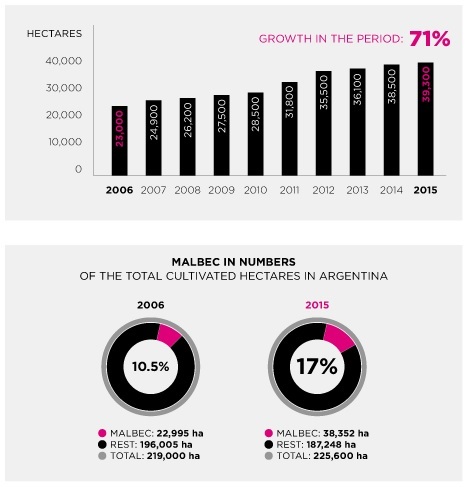 Argentina tops the list of countries that produce this variety, with 39,500 hectares. Argentine winemakers have grown Malbec extensively in all wine regions along the Andes mountain range. In the rest of the competing countries their flagship varieties have played a less prominent role: they provide a factor of differentiation, but the varieties that open markets and generate higher sales are those that are internationally outstanding. 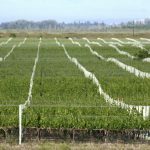 There are only a few places in the world that produce Malbec: Chile has about 6,000 hectares, France 5,300, South Africa about 4,000, New Zealand 80 and California has barely 45. 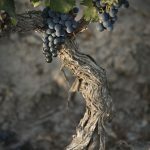 Malbec as a flagship variety for Argentina has played a fundamental role: to make Argentine wine known throughout the world. 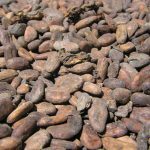 This variety has produced sales both abroad and domestically, by being grown more than the rest. This phenomenon has no comparison in the world and in the words of Luis Gutiérrez, wine critic for Wine Advocate “the sky is the limit for Argentina to continue to grow”.